Is this affordable printer perfect for the SOHO market? The HL-2300D is a fast and affordable entry-level laser with low running costs. 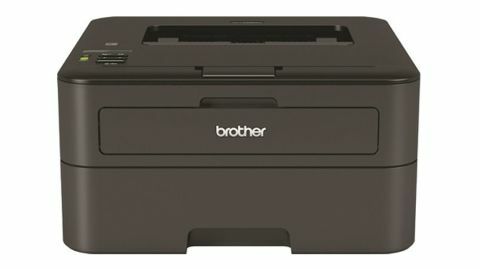 Brother has introduced a range of new laser printers for the SOHO market promising "affordable, compact and reliable print". The range includes standalone printers and all-in-ones, with RRPs ranging from just £90 (around $142, AU$165) to £251 (around $395, AU$462) including VAT. The HL-L2300D is the cheapest of the bunch, with its already low RRP being undercut: at the time of writing online retailers are selling it for about £75 (around $118, AU$138) including VAT and delivery. That's a very low price for a double-sided laser printer. Is it a bargain, or a false economy? The Brother HL-L2300D specs are impressive for the price: it promises 26ppm print speeds, has 8MB of RAM on board and delivers a maximum resolution of 2,400 x 600 dpi. The paper tray holds 250 sheets, there's a second single-sheet paper feed for labels, envelopes and thicker media, and the printer can print double-sided without any human intervention. As printers go it isn't a bad looking thing. It's small and squat – just over 30cm deep and wide – with a dark grey finish, a black top and grey detailing, and it shares the same design language as Brother's bigger business printers, all of which are essentially boxy with rounded corners. It's not something you're going to look lovingly at all day, but it's neat enough and the darker plastics make it look more attractive than its bigger Brothers. Buttons are kept to a minimum: there's a power button, four status lights and a green button marked Go. All the admin is done remotely via the supplied software, which is compatible with all versions of Windows since XP and with Mac OS X from 10.7.5 onwards. In the case of OS X the DVD simply takes you to the download page on Brother's website. On both Windows and OS X driver installation is quick and painless. Unlike Brother's more expensive printers the HL-2300D doesn't offer wireless options such as AirPrint or Google Cloud Print, and there's no Ethernet port either: you've got a choice of USB, USB or USB, and as ever you'll need to provide your own USB cable. Once installed the driver gives you a range of print options including toner save mode, the ability to reduce paper curl, the ability to select the print output quality (600 dpi is the default but you can select 300 dpi or the HQ1200 mode, which delivers up to 2,400 x 600 dpi), and you can choose to print double-sided. Print performance is very impressive: a four-page document consisting largely of graphics and printed double-sided started printing after three seconds and was completed in 17 seconds, while a densely packed four-page report consisting entirely of small text started in three seconds and was finished in fifteen. Brother claims speeds of up to 26ppm – in our tests, using default settings and text-only documents, we consistently achieved 25ppm. Speed isn't everything, of course, but the Brother's print quality was impressive too. Text was crisp and clear, if a little light when toner save mode was selected, and graphics were reproduced well without obvious artefacts or banding. Solid blocks of black were reproduced well enough too – up close you'll see some imperfections and as with text the toner saving mode makes solid blacks a little light, but it's good enough for everyday document production. Printing was pleasantly quiet too, even when churning out lots of pages, and energy saving is aggressive: the printer powers itself down with a noticeable clunk when left idle for a few minutes, but springs into life instantly when it detects a print job coming down the pipe. That's good if, like us, you work in a small office where even a slight humming noise can annoy – the Brother only makes a sound when it's doing something. The HL-2300D can use Brother's high capacity TN-2320 toner cartridge, which delivers 2,600 pages at the standard 5% coverage. Prices vary widely: at the time of writing the cheapest genuine Brother cartridges we could find were £47 (around $74, AU$86) and the most expensive £79 (around $124, AU$145). That works out as 1.7p per page and 3.0p per page respectively. The printer can also use low capacity TN-2310 cartridges, which average £35 (around $55, AU$65) for 1,200 pages (2.9p per page). Don't forget the double-sided printing capability too – if you set that as a default it should cut your paper bills considerably. The printer's drum unit (DR-2300) has an expected lifespan of 12,000 pages and an average price of £52 (around $82, AU$95), which works out at 0.4p per page.